IMAGINE YOU COULD travel backwards in time in Dublin, and strip back the glass, metal, concrete and tarmac of the modern city to replace it with timber, wattle, thatch and stone to see what Dublin was like over a thousand years ago. Dublin is a city of two names, the first of which comes from the early medieval period. There was a natural island in the middle of the River Liffey which became the main crossing point of the river. At low tide the river at the island became so shallow that mudflats were exposed, the early Dubliners lay down interwoven branches of saplings over the mudflats and these mats or hurdles allowed people and animals to cross the river and gave the area its Irish name Ath Cliatha – The Ford of the Hurdles. This original fording point of the Liffey is thought to be located close to the Brazen Head pub which is on Bridge Street, close to Merchant Quay. Prior to the Viking settlement, a monastery had been established close to where Trinity College stands today. The monks called the area Dubh Linn, Gaelic for Black Pool, as a large murky pool formed where the River Poddle met the Liffey. The Vikings kept this name, calling it Dyflinn in their Norse language, when they chose this spot to be their first Longphort or overwinter camp in 841 AD. The Vikings chose this area as it possessed many natural defensive advantages. This first overwinter camp laid the foundations for the development of the modern city of Dublin. The site that is synonymous with Viking Dublin is Wood Quay. Once the heart of one of the largest Viking settlements in the world, unfortunately much of this settlement was lost forever when Dublin City Council constructed the large concrete offices of the Dublin Corporation Offices. The story of Wood Quay was a long and complicated issue involving archaeologists, politicians, local councillors, international experts, senators, the courts and over 20,000 outraged members of the public. The fight to save Wood Quay continued throughout the 1970s and into the 1980s but ultimately the development went ahead. 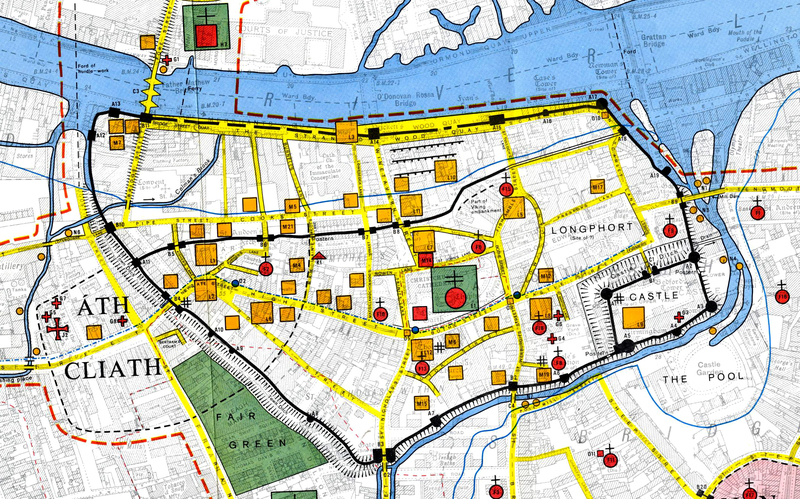 So why was the site at Wood Quay so important? The preservation of the archaeology at the site was almost unparalleled, and it offered amazing insights into the Viking and later Norman settlement. 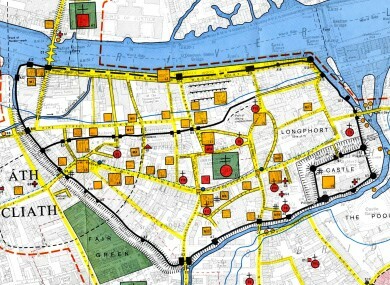 The archaeologists discovered quay fronts where the ships used to moor to offload their goods, numerous houses, shops, and craft and textile manufacturing areas and a large amount of artefacts that informed us about what people ate, how they dressed, how they worked and even how they lived and died in Dublin over a thousand years ago. Many of these artefacts are now on display at the National Museum of Ireland, on Kildare Street. The Viking settlement excavated during the Wood Quay saga mainly represented the second phase of Viking settlement in Dublin dating to the tenth and eleventh centuries. A feature of the site was the many waterfronts and revetments which held back the waters of the Liffey, and the old Norse wall which has been reconstructed and is on display within the civic offices. like small coins but are units of currency and could be used in the taverns that used to line this street during medieval times to buy a cup of wine or ale. These taverns developed during the eleventh and twelfth centuries. Fishamble Street gets its name from all the fish markets that were once held there. It is an ideal location for a fish market due to its proximity to the Liffey, and Cook Street was the area of Dublin where all the bakers sold their breads, pies and pastries. They had to sell their goods outside of the city walls as so many fires would have posed a considerable risk to the city with its tightly packed timber houses. On Cook Street you can find a surviving portion of the medieval walls that once enclosed the city, with the only functioning medieval gate in the city walls at St Audoen’s Arch. This wall has been modified over time, particularly in the early twentieth century. It now runs for 90 metres and stands approximately 7 metres in height. The original wall is thought to have been commissioned by the great Brian Boru’s grandson – Muirchertach O’Brien in around 1100 AD. After the Anglo-Norman captured Dublin at the end of the twelfth century, they quickly began a programme of refortifying the old Viking walls. They also reclaimed large areas of land from the Liffey. This area was once prosperous and settled by wealthy merchants. The large gateway you can see at St Audoen’s allowed them to access the port and their warehouses. Constructed at the western side of the medieval city wall, St Audoen’s dates to the late twelfth century, although it may stand on the site of an earlier church as a ninth century graveslab was found on the site. The church was dedicated to St Ouen (or St Audoen) of Rouen, the Patron Saint of Normandy. The church was extended and modified many times over its history. The first phase was completed by around 1200 AD. The church was a simple two celled design, with a nave and a narrower chancel. The entrance of the building was through the decorative moulded doorway that was carved in a typical late- Romanesque style. In the early years of the thirteenth century, the second phase of the church saw the chancel and nave combined to create one large room. The next phase in the early fourteenth century saw major modifications at St Audoen’s, with the development of an elaborate four bay arcade creating a new nave that nearly doubled the size of the church, following that a fifth bay was constructed in the arcade and a new chancel. The original Romanesque doorway was moved to a recess in the western end of the church where it can still be seen today. In the fifteenth century a four-storey bell tower was constructed at the western side of the church. This tower houses large bronze bells, one cast in 1423, making them the oldest church bells still in use in Ireland. Extensive excavations of the site were carried out in the 1990s and they revealed a wealth of information about the site. Today St Audoen’s is an OPW heritage site and is a wonderful (and free) place to visit. For opening hours see here. Christchurch Cathedral was originally founded in around 1028 AD and was commissioned by the Hiberno-Norse King Sitric Silkenbeard after he had completed his pilgrimage to Rome. In the 1180s the Christchurch that we are familiar with today began to take shape. reformer and strongly believed the Irish church needed to be modernised and changed. He worked diligently from Christchurch and attended many negotiations with the key political figures of the time. In 1180 St Laurence succumbed to a long illness while on pilgrimage in France. His body was buried in France, but his heart was sent back to Ireland. Encased in a heart shaped iron box it became one of Irelands most famous relics. Laurence was canonised as a saint 45 years after his death and the relic of his heart was placed in Christ Church cathedral with sprigs of mountain heather from Glendalough around it. It survived many persecutions, the most serious being the Reformation which was initiated by Henry VIII in the 1540s. Henry ordered that all relics in Christchurch be taken to Skinners Row (across the road) and burned. Many famous relics were destroyed including the true staff of Jesus which was famed throughout the country for its healing powers, yet Laurence’s heart remained untouched, until 3 March 2012 when it was stolen from the Cathedral. Its whereabouts are still unknown. For entry fees and opening hours please click here. Dublin is rather unusual as it has two cathedrals situated very close to one another. St Patrick’s Cathedral (pictured above) was constructed on the site of an earlier church in the twelfth century and consecrated as a cathedral on St Patrick’s Day 1254. Like Christchurch, St Patrick’s has changed dramatically over the centuries, particularly in the nineteenth century when the Guinness family carried out a programme of conservation and renovated and reconstructed the crumbling building into the fine cathedral it is today. See here for more details. Located on the very eastern most edge of the medieval city, Dame Street takes its name from a large dam that was constructed here across the River Poddle in the medieval period. This dam maintained the depth of water around the Castle and city walls. the waste. Such unsanitary compact living led to epidemics like the Black Death breaking out and causing devastation to medieval Dubliners. A particularly bad outbreak in 1348 is thought to have killed hundreds. People were buried in mass graves in an area of Dublin still known as the Blackpitts today. The area on which Dublin Castle stands today was part of the early Viking settlement in Dublin. As the population grew, the Vikings constructed a fortified wooden fence or palisade to protect the settlement from raids from the neighbouring Gaelic Irish kingdoms. After the Normans seized control of Dublin, King Henry II visited his newly acquired territories. He left 40 of his knights to defend Dublin. They refortified the south-eastern corner of the old Viking fort, the area that faced onto the pool in the River Poddle. The original Norman defences were probably an earthwork castle rather than stone, but in 1204 the King ordered a stone castle to be constructed on the site. There was a great need for strong defences for Dublin. The growing settlement was surrounded on all sides by Gaelic kings and chieftains who would relish the chance to raid this settlement of foreigners. This was highlighted by a savage attack that became known as Bloody Monday. On Easter Monday in 1209, a number of the Anglo-Norman citizens of Dublin ventured out to an area known as Cullenswood where modern Ranelagh stands today. They hoped to enjoy the weather, spending the afternoon picnicking and hunting in the fresh air away from the cloying stink of the city. Unbeknownst to them, a band of Gaelic warriors, probably led by the O’Byrne and O’Toole families, saw their opportunity and descended on the unaware citizens. They massacred around 500 people in a bloody and savage attack. Following this the work on the city defences was accelerated, with the Castle being completed by around 1230 AD. The castle was surrounded by a deep moat, with imposing high stone walls and large circular towers at each corner. The Castle has changed dramatically from its medieval origins. It was severely damaged by a fire in 1684, and was largely demolished in the eighteenth century to make way for today’s castle. Only one tower from its medieval past still stands above ground, and the Black Pool which originally gave Dublin its name has now become the Castle gardens. and sound effects, and helps to bring to life the story of the early Dubliners. It costs just €1.99 and is available from here (follow this link for a free preview). If you’d like to discover more about Medieval Dublin, I recommend paying a visit to the superb (and free to enter!) National Museum of Ireland on Kildare Street, and Dublinia opposite Christchurch, where you can come face to face with Dublin’s medieval past. This marker sits in a flagstone on the opposite side of the street from Dublinia, behind Christchurch. The historical re-enactment photoshoot was with Claíomh. All photographs © Neil Jackman/abartaheritage.ie The map © National Archives. Email “Ever wondered where medieval Dubliners went for a pint?”. Feedback on “Ever wondered where medieval Dubliners went for a pint?”.